Posted on February 6, 2019, in Photography and tagged 365 photo project, black and white photography, learning to see, lubbock texas, melinda green harvey, monochrome, one day one image, photo a day, photography, postaday, texas, thoughtful seeing, to be sold eventually to strangers. Bookmark the permalink. 14 Comments. Whose shadow on the wall? Well, you must have had the camera on the tripod…..
Yep! But panic not, I won’t recognise you! If you DO recognize me, just give me secret handshake so that I know it’s you. 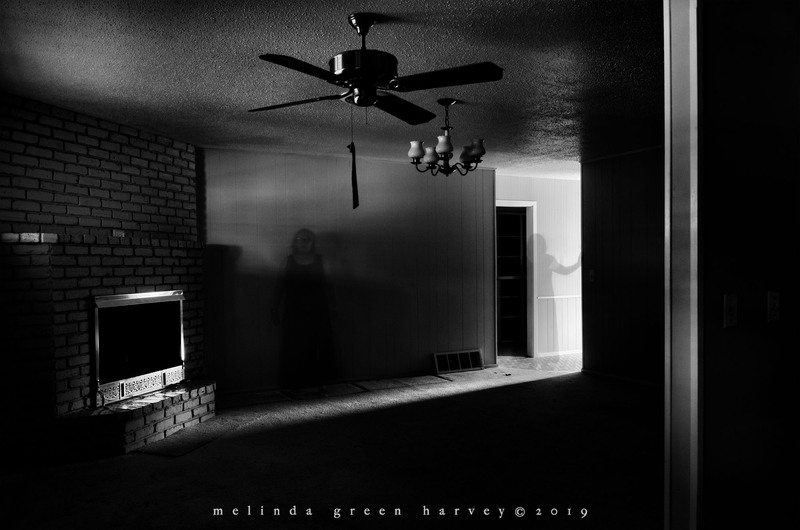 Another beautifully told story, Melinda, with matching photograph. I didn’t see the (your) figure at first. How haunting. Your melancholy expressed through the room itself, and amplified by the figure. I’ve geared up again . Tomorrow I’ll be back to the usual drivel. FYI. Damn spell check. That’s teared up again. Ha! Ha! I was assuming that’s what you meant, which I guess makes me smarter than spell check? How very sad for you … but we have to make these decisions don’t we? A fabulous photo Melinda ..